TBT History: Earned a spot in the field of 64 in the TBT Jamboree. Lost in the second round to Team Colorado. Nutshell: Comprised mostly of players from the Philadelphia area. Developed great chemistry in the Jamboree last summer. One of the best shooting teams in TBT. Feeling slighted comes with the territory of being a Philadelphia sports fan, so it was only fitting the City of Brotherly Love-based Broad Street Brawlers believed they were snubbed when they didn’t receive an at-large bid for TBT’s West region last summer. 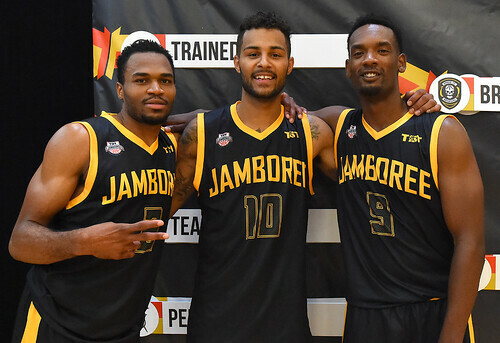 The Brawlers coughed up the money for TBT’s Jamboree as a last-ditch effort to enter the field of 64 and assembled some of Philly’s best former college players to help them secure that final spot in Las Vegas. Headlined by former Drexel teammates Chris Fouch and Samme Givens and former D-II Player of the Year Christian Burns, the Brawlers cruised through their opponents to earn their spot in the West region. Based on how well they played, the Brawlers did more than prove the TBT committee that they were worthy of a bid, and they’ll carry that chip on their shoulder into TBT 2018. It was a close game through half-time, with the Broad Street Brawlers only trailing by 2 points. Team Colorado gained some momentum in the second half, pulling away by 14 points to claim their spot in the super sixteen. Team Colorado stood out by making 15 three-point shots, making just over half of their attempts. Christopher Copeland (31 points) and Marcus Hall (30 points) and continued their strong TBT showings as #1 seed Team Colorado used a strong second half to move past the #9 seed Broad Street Brawlers, 111-95. 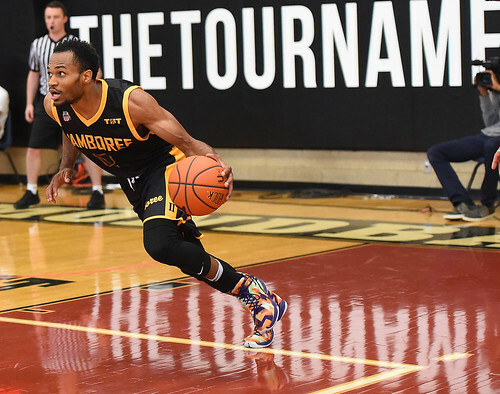 Copeland, who posted a double-double in Team Colorado’s opening-round win, led all scorers as the TBT 2016 runner-ups moved on to the Super 16 once again. Vee Stanford, who led the way with 24 points in the Brawlers’ opening game on Saturday, finished a strong TBT performance by tallying a team-best 25 points in the loss. Sammy Zeglinski scored nine of his 23 points in overtime, and the #9 seed Broad Street Brawlers survived against #8 seed Trained to Go, 108-95. 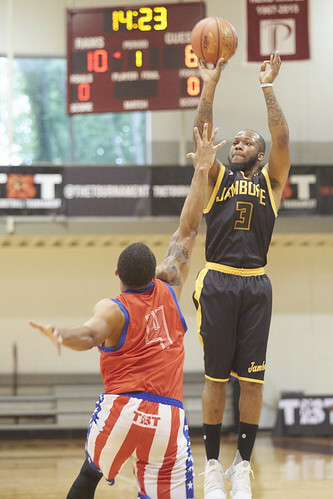 Zeglinski made 11 of his 12 free-throw attempts, and both Vee Stanford (24 points) and Dyshawn Pierre (22 points) also chipped in with strong performances for the Brawlers, who entered the field of 64 after cruising through the inaugural TBT Jamboree last month. Charles Davis led the way for Trained to Go, scoring a team-high 23 points in the losing effort. 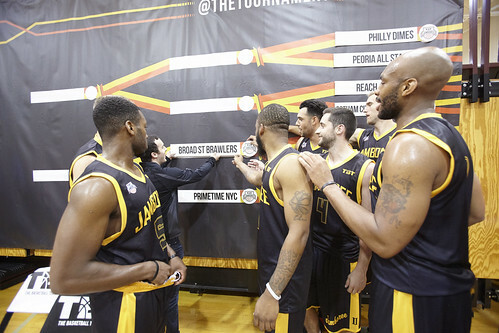 The West regional of TBT2017 is officially set, as Broad Street Brawlers took down Primetime NYC 77-68 at Philadelphia University on Sunday afternoon. It was a back-and-forth first half that resulted in Primetime heading to the locker leading 37-36. But BSB got going in the second half, shooting 50% from the field (14-28) and connecting on an even better clip from behind the arc – 55.6% (5-9). For the second straight game, former Philly U player Christian Burns looked very comfortable on his old home court. The 6’8” power forward was a beast for BSB, going for a game-high 22 points (8-11) and nine rebounds. Former West Virginia sharpshooter Dalton Pepper hit four threes (19 points total) and Samme Givens added a double-double with 10 points and 11 boards. Jesse Jones has a great game for NYC. He led the team with 19 points and shot 70% from the field (7-10) – including going 5-7 from 3PT land. Gary Ervin was another bright spot for NYC, chipping in 16 points and six rebounds. With so much talent in the West regional of TBT2017, the Brawlers are going to have to channel their own team name if they want to make a run in a regional that will be a serious grind. It was an early tip-off in Philadelphia this morning, but neither team wasted time getting going in the Jamboree West semifinal. Broad Street Brawlers took advantage of cold 3-PT shooting from Las Vegas (3-13 in the first half; 23.1%) to take a 49-44 lead into halftime. They came out strong to start the second, pushing their lead to as many as 10. But the Chess Center had no intentions of lying down. They chipped away at the Brawlers lead, cutting it to just three late in the second half. 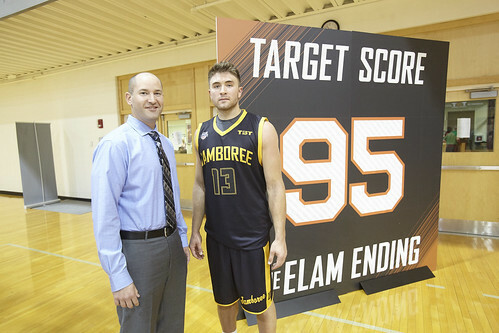 With a foul call at just under four minutes to play, the first ever Elam Ending was put into play. Broad Street led 88-84, setting the target winning score at 95 (88+7). Broad Street’s post scoring proved to be too much for Vegas to overcome, and a free throw from Dalton Pepper sealed the 95-88 win the Ballers. The Brawlers really benefitted from spreading the love on offense. Six of Broad Street’s seven players scored, and every player that did ended with at least 12 points. Center Peter Alexis led the way with 21 points and six rebounds. 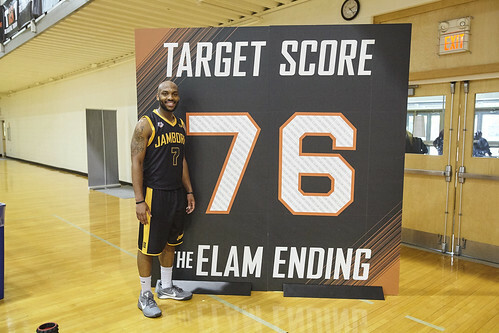 Shooting guard Chris Fouch added 18 points and Philly University alumni Christian Burns pitched in 14 points and nine boards on his old home court. Small forward Antwan Wilkerson shined for Las Vegas Chess Center with 28 points (12-18 FG) and 9 rebounds. Power forward David Haughton went for a double-double with 15 points and 12 rebounds, but the Chess Center just couldn’t knock down enough shots from behind the arc or the charity stripe to advance. 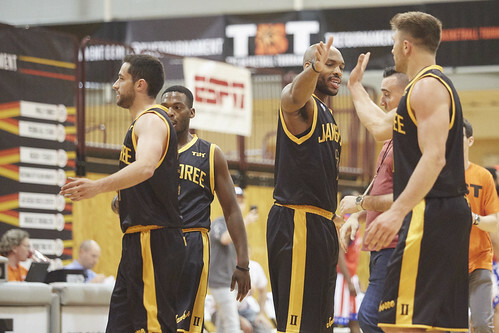 The win for Broad Street means they’ll move on to face Primetime NYC tomorrow for the final spot in the West for TBT2017. That game will tip-off at 12:45 on WatchESPN.